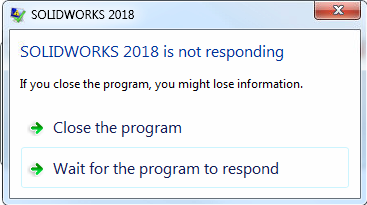 So you’re getting that message “SOLIDWORKS 20XX is not responding….” and are given the choice to either “Close the program” or “Wait for the program to respond”. Don’t close the program yet… Hold your horses, Speed Racer! 🙂 Your best choice depends on what is actually going on in SOLIDWORKS. It’s hard to know what exactly is going on behind the scenes without a degree in computer science, but if we check the Task Manager, we’ll be able to at least find out whether the SOLIDWORKS process is grabbing more memory or not. If it is, then game on, and might as well let the process keep running while we go stretch the legs, make a snack, or maybe take one of those “breaks” that “they” say we need to take for our mental and physical health. But first, maybe keep reading for one more minute…. So as to the steps… let’s hit the old Ctrl+Alt+Delete and choose Task Manager. Once there, choose More details if necessary and find the SOLIDWORKS process (otherwise known as SLDWORKS.exe). Might need to sort by Memory. Note how much memory (RAM) that process is using. Does that number ever change, at all? If it hasn’t changed in five or ten minutes, then might be time to consider choosing “Close the program”, because it’s likely not going to recover, even if you wait until the 25th century like Buck Rogers. If you can afford another half an hour, maybe wait until after your lunch, then it’s your call. But if it HAS twitched during this time, even a little bit (and usually in the upward direction), then that is a very positive sign that the SOLIDWORKS application (and this applies to other applications as well) is on its way to completing whatever mighty task on which it is focused. What task is that, you ask? Well, did you ask it to rebuild some complex geometry, or pattern many thousands of features across a sheet? That could be the prime suspect. At next opportunity you might want to try running a Performance Evaluation (found in Tools->Evaluate) to see what’s taking the majority of that rebuild time. It may be time to try using the Freeze Bar, and/or the Geometry Pattern option for the pattern feature, but that is another story. If you don’t need that feature right now, consider suppressing it or freezing it so it doesn’t slow you down. For now, if you see the memory usage change at all, then we recommend waiting it out to see what happens….chances are that SOLIDWORKS will finish up what it was doing and you’ll be back to blissful productivity soon. Why does Windows have to configure SOLIDWORKS every time it is launched? Home › SOLIDWORKS Tech Tip › “SOLIDWORKS is not responding!” But will it?